​The white perch is not really a perch, however it is a fish of the temperate bass family. 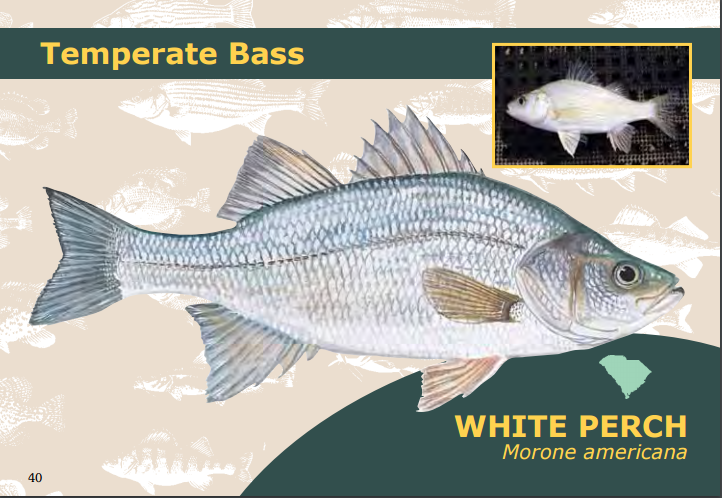 Sometimes the White Crappie is called "White Perch", however The White Perch is sometimes incorrectly as "Silver Bass". This is most likely because it is generally silvery-white in color. The white perch is about 49.5 cm (19.5 in) length, and weighs about 2.2 kg (4.9 lb). The White Perch likes to eat eggs of many other species living in the Great Lakes, and it also eats worms, shrimp, crabs, insects, and other small fishes. At times, fish eggs are 100% of their diet. The conservation status of the White Perch is "Least Concern", because they reproduce so fast. They can have over 150,000 eggs in a spawning season. The white Perch can destroy fisheries, due to this some states consider the white perch to be "a nuisance species". Many states have laws that forbid the possession of a live White Perch, also these states recommend not releasing them once captured. ​ Guide to Freshwater Fishes. DNR, n.d. Web. 18 Nov. 2016.